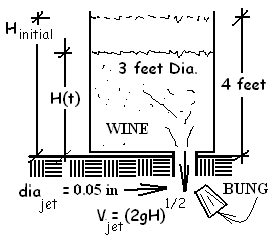 Depth of Wine | THERMO Spoken Here! ♦ We can write the mass equation first; without concern of the system (It applies to all systems). The system will be the water in the tank with a "flux" or mass outflow at the port in the tank bottom. The above equation cannot be solved - It has two time-dependent terms, the depth of wine and the exiting speed of the jet of wine. However, we can use Torricelli's theorem that expresses the exiting velocity in terms of the changing depth of the wine. So we have a first-order differential equation with an initial and final condition. We have solved so many of these we can watch TV and do it. Separate the variables, apply integration. Notice above that density is not "divided out." The equation is a "mass equation," we leave it as that until the mechanics of solution. Below we rearrange, integrate and apply limits. See the negative sign on the right-of-equality integral. Every "second masses" in the cask will be less than previous mass. Therefore all Δm = m2 - m1 will be negative. So the negative sign ahead of the right-side integral is physically correct. Also the time will be greater the larger the cask diameter, D, and shorter the larger the exiting jet diameter d. Use your calculus to obtain the answer.